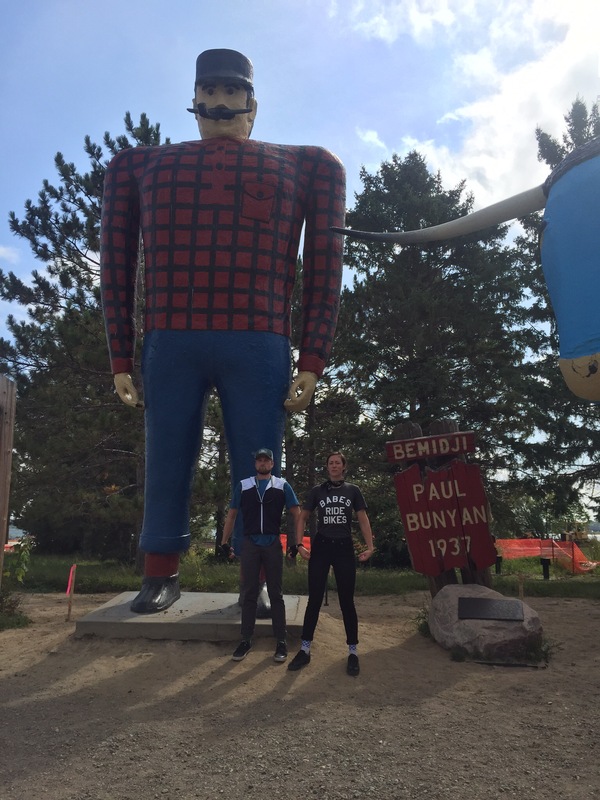 We first encountered the Mississippi a few miles outside of Bemidji, MN, home of Paul Bunyan and his blue ox Babe. The countryside, one of dark fragrant pine forests and vast grassy marshes, was beginning to yield to agriculture. Scandinavian style barns, with their steeply curved roofs, staked claim beside rocky meadows where cattle grazed. Where enough rocks had been cleared, enterprising farmers planted plots of corn, much shorter at this time of year than their Illinois cousins to which I am accustomed. We were crossing from the Great North Woods into the agricultural Midwest. Still impressed by our meeting with Deb and Hob, the veteran world bike packers of earlier blog post fame, we rolled away from the natural foods co-op. In a place where convenience stores have been our primary source of groceries, the co-op was an oasis. Laden down with heirloom tomatoes, fresh mozzarella, cured sausage and other ingredients that would reunite to form “thin crust” (read tortilla) pizzas in Nevis, MN, a culinary high point for us on the trip, we pedaled toward Lake Itasca, the headwaters of the Mississippi. Shortly out of town, the road sloped gently downwards. At the bottom of a shallow valley, a small dark ribbon wound between grassy banks flanked by gnarled oaks, white pines, glistening birch and maple. We had reached the Mississippi River. 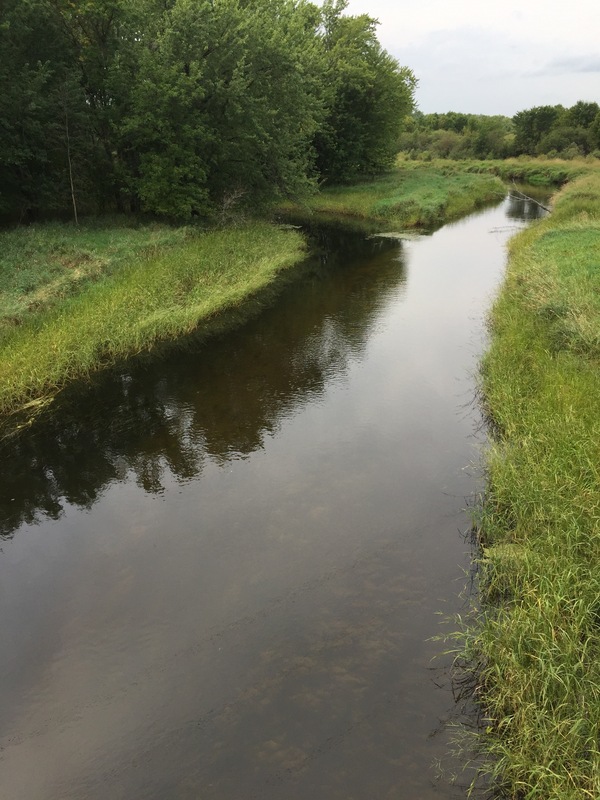 It was hard to believe that this little stream, hardly big enough for two canoes to travel side by side, would become the enormous working river that connects these North Woods to the Gulf of Mexico, draining a third of the country along its path. The gentle roll of the land continued as we followed the Mississippi upriver and south towards Itasca State Park. At the boat launch along the side of the road, two First Nation men lashing their canoe to the top of their truck waved as we rode by. Storm clouds brewed to the west as afternoon rays cut bright angles across the sky. Our campground was still 15 miles away. The first wave of rain came. We took shelter under a large oak tree, thinking with apprehension of the miles ahead of us. At a break in the rain, we pushed on and put a few more miles behind us. 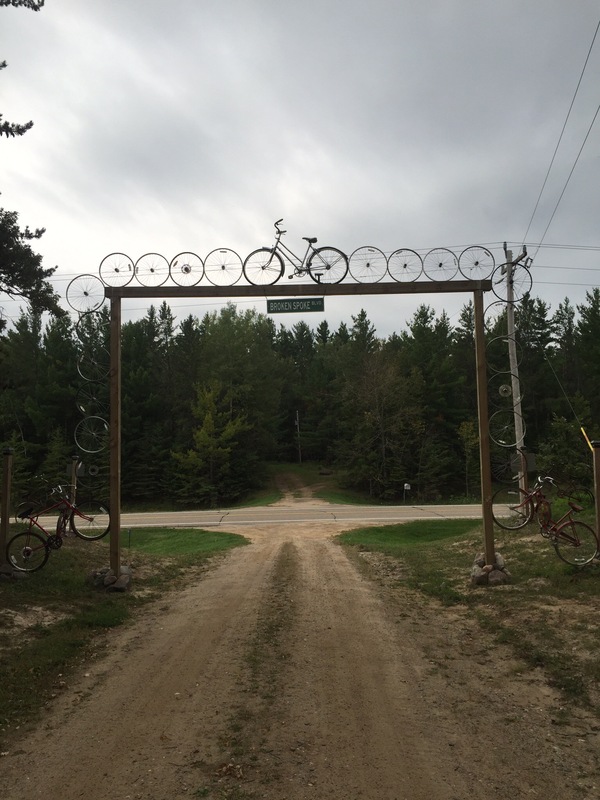 Just as another dark bank of clouds bore down from the west, Kristen spied a driveway with an archway adorned with old bicycle wheels and frames. “Broken Spoke Drive” read a sign nailed to the archway. “We should find out who lives here,” Kristen said. We turned down the gravel driveway in the otherwise solid bank of trees that lined the road. Here and there, the front halves of bicycles protruded for tree trunks. An old rusty beach cruiser hung suspended over our path from another free. Eventually, the lane opened up into a large asphalt driveway bordered by work sheds, garages and a large wooden house with a wraparound porch overlooking a sweeping valley with cornfields, pastures and forest. Scattered around the driveway were an assortment of children’s bikes. An old yellow golden retriever chow chow mix bellowed our arrival and a smiling young woman stepped out of the house with a youngster on her hip. She introduced herself as Caren. We soon learned that her husband Sam was the owner of Itasca Sports bike shop, which explained the extensive bicycle decorations. When we inquired about a safe place to camp, without hesitation Caren insisted that we pitch our tent anywhere on the property. While we spoke, other curious children emerged from the house and started showing off on their own bikes and trikes. Ten-year-old Grant rode his unicycle, which I attempted and quickly realized was extremely difficult and almost nothing like cycling on two wheels. Kristen and I pitched our tent in a lovely oak grove and set in on preparing a meal of tuna mac and cheese. Just then we heard the sound of an ATV and looked up to find Sam with one of his daughters approaching. Tall and trim with red blond hair and goatee, he warmly welcomed us and asked about our ride. We learned he is an avid cyclist himself and builds custom bikes as a hobby. Before leaving us to our dinner, he asked whether we would be interested in joining their family for pancakes, eggs and bacon in the morning, to which we heartily agreed. At a few minutes to eight the next morning we set off walking down the misty lane back to the house while soft morning light filtered through the canopy, a omen of good weather for our visit to the headwaters. Before we even knocked on the door, the irresistible smell of frying bacon met our nostrils. One of the smallest children answered our knock and let us into the bustling home. Sun poured in the large bay windows overlooking the valley while kids played and helped set the table. Grant, the mohawked unicyclist, manned the griddle, flipping pancakes and frying eggs like a seasoned line cook. We were warmly welcomed with a steaming cup of coffee and local honey. It was Saturday of Labor Day Weekend, one of the busiest for the shop, but Sam had arranged his staff so that he could spend the morning with his family. A short while later we sat down to a table heaped with pancakes, eggs, apple cider, fresh fruit, bacon and carafes of coffee. After a quick prayer, in which Sam wished us a safe onward journey, we dug in. Between mouthfuls of delicious food, we learned that Caren and Sam had met in the Navy. Sam had grown up on the same property he and his family now lived on. Caren hailed originally from New Jersey. They first met in Hawaii where she was a Navy dental technician and he was deployed on a submarine. As breakfast wrapped up, Kristen and I repaid what little we could of the hospitality extended to us by attacking the stack of dishes. Caren and Sam inquired about our route since they were planning a trip down the river of their own. A fellow Navy vet was swimming the entire length of the Mississippi and Sam, a trained EMT, had volunteered to accompany him in a kayak on the southern portion. Since the bike shop business slowed in the fall, the family of eight planned to set off in their RV and spend a few months exploring an unknown stretch of the river that began in their back yard. Their experiences would complement the homeschooling the kids would receive for their fall in the river. After exchanging contact information and making a plan to meet up somewhere farther down the river, we stepped out onto the sprawling front porch for a photo. We said our goodbyes to this lovely and welcoming family, packed up our bikes and rolled off towards the headwaters of the Mississippi. 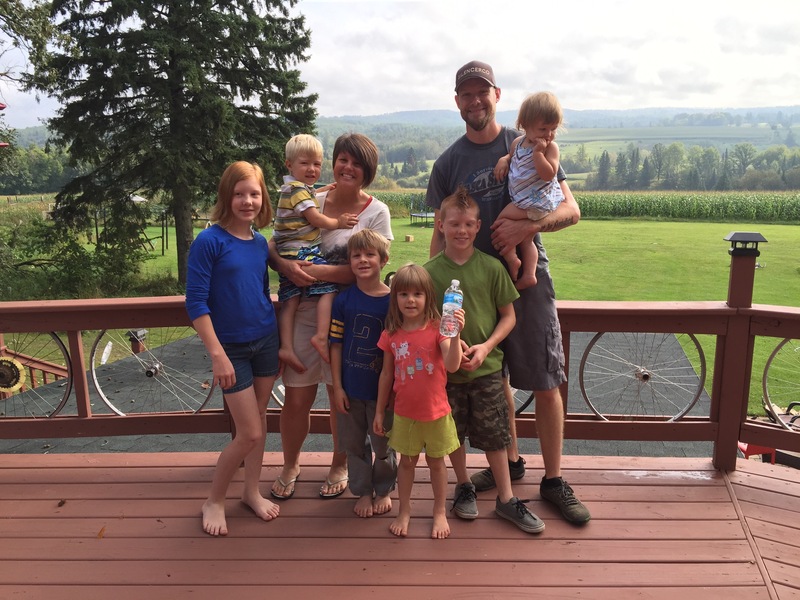 A great story…the weather led you two to another wonderful family of cyclists who were willing to share their land, food and family with you! Safe trip south for you. Should be getting cooler in temps soon. We have been blessed with mostly good weather (with the exception of some strong and persistent headwinds!). Can’t wait to start exploring the stretch of Mississippi south of the farm! Where’s the blog on Deb and Hob? I ran into them in Dickinson, ND back on the morning of August 24, 2015. Great couple, assuming it’s the some one…on the tandem bicycle. Hi Grant! Sorry for the tardy reply. It must’ve been Hob and Deb. They didn’t share any contact info or blog site. Sorry.